(NaturalNews) Two studies by Harvard University and Washington State University have had surprising results and found that, contrary to the usual advice, reducing your alcohol intake might not be crucial to losing weight – in fact, the opposite is true of wine. According to The Sun, scientists have found that wine contains a compound called resveratrol, which restricts the conversion of fat cells. Just two glasses a day can reduce obesity by up to 70 percent. The same was reported in a study at the University of Ulm in Germany, which found that resveratrol works to inhibit the precursors to fat cells (known as preadipocytes) from increasing and converting to mature adipocytes, as well as limiting fat storage. In its original form, resveratrol functions as a phytoalexin, which is an antimicrobial compound that is naturally produced by plants to protect themselves from environmental stress and infections. When it is eaten by humans, resveratrol provides different benefits, and is thought to protect against not only obesity, but also diabetes, high cholesterol and blood clots. As reported by the Natural Health Advisory Institute, those suffering from type 2 diabetes should drink wine to help control their blood sugar, as it can improve insulin resistance and reduce blood glucose. 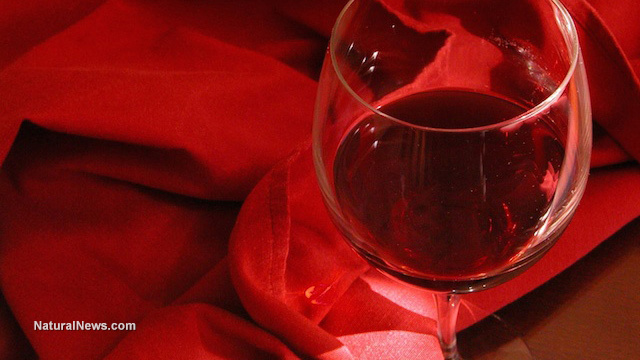 Red wine has been shown to produce the greatest effects – although this is dependent upon your body's metabolic rate. According to CBS News, resveratrol also has anti-aging properties, as it stimulates the production of SIRT1. SIRT1 is a serum that prevents diseases and slows aging by boosting the energy production in our cells. David Sinclair, a professor of genetics at Harvard Medical School, stated that "in the history of pharmaceuticals, there has never been a drug that binds to a protein to make it run faster in the way that resveratrol activates SIRT1." Meanwhile, according to Life Hack, red wine in particular has also been linked to improved heart health, and research by the University of Alberta has found that resveratrol improves the health of your heart, brain and bones in the same way that going to the gym does. By far the most fascinating benefit of drinking red wine is that it suppresses the activity of a cancer-causing enzyme called aromatase – reducing your chances of developing cancer. Life Hack reports that studies have shown a 50 percent reduction in the risk of developing colon cancer with the moderate consumption of red wine. This is supported by a different report by Harvard Men's Health Watch, which suggests that men who drink between four and seven glasses of red wine every week are only 52 percent as likely to be diagnosed with prostate cancer as men who don't drink wine at all. Why drink wine before bed? The benefits of getting more resveratrol in your diet are numerous, and have been proven by a variety of studies conducted across the world. But an earlier Harvard study in 2012 found that drinking wine later in the day can actually reduce your hunger in the evening, making you less likely to snack. As reported in the Daily Mail, snacking in the evening can cause weight gain, because it disrupts your metabolic clock, forcing your organs to process foods when they should be taking a break. This impact on your natural rhythm makes you less likely to fall asleep when you want to, while your body digests those unnecessary extra calories. Sleep deprivation has in turn been linked to over-eating, which creates a cycle of not getting enough sleep, not digesting food properly and eating more than your recommended calorie intake for the day. Reducing your evening hunger with a glass of wine will help prevent weight gain from late night snacking. It is important to note that if you aren't a drinker, there are other ways to get more resveratrol in your diet; snacking on berries, grapes and apples will also boost your levels of this compound and inhibit the conversion of fats. In fact, it's the grapes that are responsible for the health benefits of wine in the first place.